We have devoted years driving through the many dovetailed neighborhoods in and around the Emory area helping purchasers find just the right property to fit their needs. Many have been folks in search of a comfortable retreat to help them concentrate on their studies, while others have decided to settle in and make this convenient intown area their permanent home. 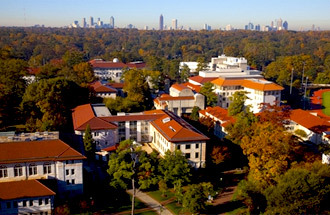 The Emory area is also highly desirous because of the wonderful architecture. Homes built in the Druid Hills Historic District during the early 20th century are among the finest examples of period architecture in Atlanta, if not the entire State of Georgia. These period houses range from bungalows to mansions. Druid Hills is roughly bounded by the Fulton County line on the west, with Briarcliff Road to the northwest, just over the Emory Road line on the north and following the south side of Emory Road. The boundary cuts south and juts east around the Fernbank Forest and Recreational Center, then cuts east and south along tracks of the Seaboard Coast Line. South it is bordered by North Ave. and the Atlanta City Boundary. Emory and Druid Hills will offer you classic in town living with all the benefits of the arts, entertainment, restaurants and its distinctive design. The cost for such accommodations will range widely from one neighborhood to the next. Look for a professional to help you find homes in your range or plan to spend many hours driving trying to locate the many separated areas and neighborhoods that would best fit your specific needs and price. Also of great interest to those looking for convenience to the Emory area are the beautiful Morningside, Virginia Highlands, Ansley Park, Piedmont Park and other Midtown areas.